I'm not sure if Cake Pops should be thought of as a cake or a confection. But either way, they are oh so cute. 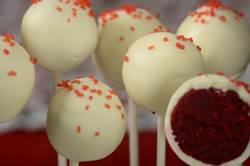 This Cake Pop combines Red Velvet Cake with a Cream Cheese Frosting. Once made they are dipped in white chocolate candy melts which gives the Cake Pops a hard outer shell. To dress them up I like to sprinkle them with red candy sprinkles. Kids love them as do adults, and for a party they make a unique centerpiece or cover each cake pop with a small cellophane party bag and tie the end with a twist tie or ribbon to give as party favors. To start we need to make a Red Velvet Cake and some Cream Cheese Frosting. You can make and store the cake balls in the refrigerator 3-4 days before dipping in the candy coating. So the steps are - bake the cake, make the frosting, crumble the cake, combine frosting and cake crumbs, roll into balls, insert sticks, refrigerate until firm, melt candy coating or white chocolate, dip cake balls in coating, and let dry. A few notes on ingredients. Candy coating is also known as candy melts, candy wafers, confectionery coating, compound coating, bark coating, candy chocolate, or summer coating. It's made from a mixture of sugar, milk solids, vegetable oils, flavoring, and coloring, and I think it tastes a lot like sweet white chocolate. You can store the candy coating in a cool dry place, usually up to 18 months. But do not refrigerate. Candy coating is sold at cake decorating, craft stores, or online. What is so nice about this product is how easy it is to work with, its wide range of colors and flavors, and how it dries to a hard crisp outer shell, similar in texture to tempered chocolate. I normally add a little shortening or paramount crystals (made from palm kernel oil, lecithin, and citric acid) to the melted candy coating to make it smooth and fluid, so you get a nice, not too thick, candy coating on the cake balls. For the cake pops you will need about 25 - 4 1/2 inch (11 cm) long cake pop sticks (known as lollipop or sucker sticks) to insert into your cake balls. And you will also need a large thick piece of styrofoam (or florist's foam) for drying the cake balls (also makes a nice centerpiece). If you don't have any styrofoam at home, you can buy it at cake decorating or craft stores. Red Velvet Cake: Preheat your oven to 350 degrees F (180 degrees C) and place your oven rack in the center of the oven. Butter, or spray with a non stick spray, a 9 x 2 inch (23 x 5 cm) round cake pan and then line the bottom of the pan with parchment paper. In the bowl of your electric mixer, or with a hand mixer, beat the butter until creamy and smooth. Add the sugar and vanilla extract and beat until light and fluffy (about 2-3 minutes). Add the egg and beat until incorporated. Scrape down the sides and bottom of your bowl as needed. In a measuring cup carefully whisk the buttermilk with the red food coloring. Then, with the mixer on low speed, alternately add the flour mixture (in three additions) and buttermilk (in two additions) to the butter mixture, beginning and ending with the flour. In a small cup combine the vinegar and baking soda. Allow the mixture to fizz and then quickly fold it into the cake batter. Working quickly, pour the batter into the cake pan, smoothing the top with an offset spatula or the back of a spoon. Bake in the preheated oven for approximately 25 minutes, or until the center of the cake springs back when lightly pressed, the cake starts to pull away from the sides of the pan, and a toothpick inserted in the center of the cake just comes out clean. Cool the cake, in the pan, on a wire rack for 10 minutes. Place a wire rack on top of the cake pan and invert, lifting off the pan. Peel off the parchment paper, re-invert, and let the cake cool completely. Cream Cheese Frosting: In the bowl of your electric mixer (or with a hand mixer), beat the cream cheese and butter, on medium-low speed, until smooth. Add the powdered sugar and beat, on medium-low speed, until fully incorporated and smooth. Beat in the vanilla extract. Roll the mixture into golf ball sized rounds (about 1 1/2 inches (4 cm) or 1 ounce (25 grams)). I find this is a good cake-to-candy-coating ratio. Place the cake balls on a parchment or wax paper- lined baking sheet. After forming the cake balls, insert the lollipop sticks (don't insert the sticks all the way through the cake balls or they will crack), cover the baking sheet with plastic wrap and place in the refrigerator until they are firm (about 2 hours). At this point, you can store the cake balls in the refrigerator for 2-3 days before dipping in the candy melts or the unfrosted cake balls can be frozen for a couple of months (if freezing do not insert the lollipop sticks). If freezing, defrost the cake balls in the refrigerator overnight before dipping in the candy melts, because if the cake balls are frozen and you dip them in the warm candy melts, you may find that the candy coating cracks after it dries. That is because as the frozen cake balls defrost, they expand, causing the coating to crack. Once the cake balls are cold, it is time to melt the candy coating. You can do this in the microwave or in a heatproof bowl placed over a saucepan of simmering water. If using the microwave, place the candy melts in a microwaveable bowl and heat on medium for about 30 seconds. Stir and continue to heat on medium, at 10-15 second intervals, until the candy melts evenly. If the melted candy is too thick, gradually stir in 1/2-1 teaspoon shortening or 1/4 - 1/2 teaspoon paramount crystals into the melted candy coating until smooth and fluid. You want it to flow easily from your spoon. (This prevents the candy coating from being too thick, which makes the cake balls hard to dip and may cause cracking.) At this point transfer the melted candy coating to a small deep bowl so when dipping the cake pops they can be completely submerged. Before you start dipping the cake balls have a large thick block of styrofoam (or florist's foam) on hand to stick the cake pops into for drying. Remove the cake balls from the refrigerator and one by one, dip the cake pops straight down into the melted candy coating. Dip the cake pops completely into the coating. Then lift the cake pops out of the coating and let the excess coating run off, turning the cake pop so you get an even coating of candy. You can also gently tap the stick on the side of the bowl to help with this. If there are bubbles, burst them gently with the end of a toothpick. At this point you can sprinkle the still wet candy coating with candy sprinkles, sanding or sparkling sugar, edible pearls or glitter, chocolate jimmies, finely chopped nuts, crushed cookies, dried coconut, or even crushed candy. The cake pops need to dry upright, so gently insert the end of the stick into the styrofoam and let dry. If you find some of the candy coating has dripped down the lollipop sticks, use your fingertips to wipe it off. (This can happen if you don't let the excess coating run off the cake pop, if the candy coating was a little too hot for dipping, or if it was a little too thin or too thick.) Once dry, the cake pops can be covered and stored, at room temperature or in the refrigerator, for about 3-4 days. Makes about 25 cake pops. Note: You can make a good substitute for buttermilk by stirring 1/2 tablespoon lemon juice into 1/2 cup (120 ml) milk. Let stand at room temperature for 10 minutes and it's ready to use.